"I have no interest in ordinary humans. If there are any aliens, time travelers, espers, or dimension sliders out there, come find me!" Not your typical high school introduction, but for Suzumiya Haruhi, nothing less would have sufficed. Brave souls who try talking to Haruhi are met with a simple 'not worth my attention.' Master of both pen and sword, and with good looks to boot, she should be a popular girl surrounded by fans. Yet, her spiteful you-are-too-ordinary attitude, nurtured since her time in middle school, drives everyone away. So beneath her attention are ordinary humans that she doesn't care if boys are still around when it is time to get changed for PE classes. But nobody can predict what will happen when the ever-discontent Haruhi is inspired to make her own club – the only one worthy of her membership. 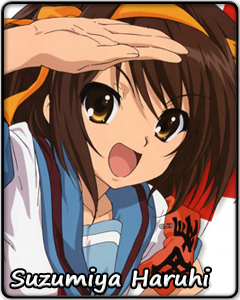 Haruhi might sometimes seem more like a force of nature than a rationally thinking individual. But, appearances can be deceiving. From time to time, even she has to pause in her mad dash ahead. And when she does, she thinks about the true reason behind her wild escapades and a look of melancholy, so unlike her, appears on her face. But at the same time, with every day spent with her new companions, Haruhi comes closer to the realization that what she has been so desperately looking for might actually be right by her side.